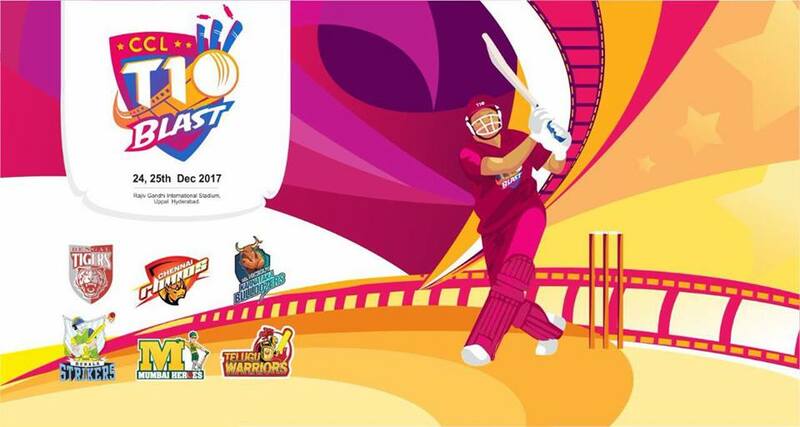 Bengal Tigers, Kerala Strikers, Chennai Rhinos, karnataka Bulldozers, Telugu Warriors and Mumbai Heros are ready to take part in ccl 2017 edition aka CCL T10 Blast. latest season of celebrity cricket league having some major changes, only 10 overs to one side and it’s end up within 90 minutes. 2017 ccl will feature Film Stars from 6 Languages who have carried a passion for the game of cricket. Sony ESPM and Sun tv channels holding the telecast rights of celebrity cricket league season 2017, we can expect live streaming through sun nxt application also. Schedule of CCL T10 Blast – This time only 7 matches in the league including finals, each team have 2 matches and winners based on top points will lead to finals. Hyderabad hosting celebrity cricket matches, it will happening on 24th and 25th of this month. Chennai Rhinos Vs Bengal Tigers is the opening match of ccl, 02.00 P.M to 04.00 P.M is match time. There are 4 matches in the first day, finals will be on 25th December 2017 at 08.30 P.M to 10.30 P.M. Please check and download full schedule of CCL T10 Blast from here. Live coverage Available Through Sony ESPN, Surya Movies (Malayalam) , KTV (Tamil), Udaya Movies (Kannada) and Gemini Movies (Telugu). enjoy your favorite films stars playing cricket and support them by watching it.